If you already use VDP, and already use vApps, you will be aware that VDP does not currently backup and restore vApp constructs. Instead it backs up and restore the individual VMs within a vApp. I know this is something that we are looking at, but since VDP currently doesn’t do this, I had to look at whether or not vCops would continue to function if its VMs were restored outside of a vApp. This was the purpose of this first test. This shows us that there are two VMs to be restored, Analytics and UI, each with two disks. This is our vCops product set. So let’s now restore it, but restore it to a different location, not the original location. VDP allows us to do that. In this case I am restoring my vCops UI VM to a different location in the vCenter inventory. 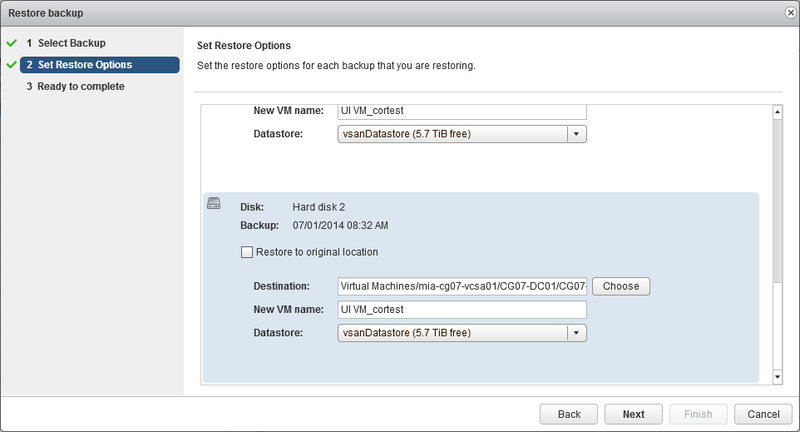 By clicking on the ‘Choose’ button, I can select to restore to the cluster object rather than the vCops vApp. I am also restoring the VM to a VSAN datastore (a list of datastores is displayed via a drop down list). Later versions of both VDP and vCops are supported on VSAN – read more about VSAN interop here. When the restore was completed, I powered off my currently running vCops vApp, and powered on these new stand-alone VMs (Analytics and UI). The analytics VM should be powered up first, followed by the UI VM once the Analytics has been up for approx 5 minutes or VMware Tools has started in the Analytics VM (this is the behaviour as per the vApp startup sequence). 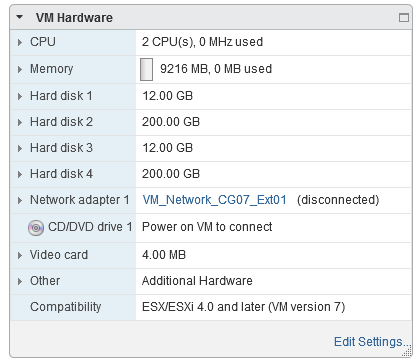 Both VMs came up OK and I was able to launch my vCops interface and monitor my vCenter. However, now care is needed each time you wish to power on the vCops VMs. You will manually have to ensure that the Analytics VM is ready before powering on the UI VM. This is what the vApp structure gives you. Normally, you would not have to worry about this, you simply power on the vCops vApp and it takes care of the start-up sequence. What about a situation where your vCops needs to be restored, but the original vApp has been lost and you wish to restore the VMs to a new vApp, not as stand-alone VMs. You’ve seen in the previous example where stand-alone VMs can be used, but what if you wish to put back a vApp construct around your vCops VMs? I deleted the original SCSI devices 0:0 and 0:1 (Hard disk 1 and Hard disk 2) on each VM, and then moved my restored disk 0:2 to 0:0, and my restored disk 0:3 to 0:1 (basically moving disk 3 & 4 to disk 1 and 2 positions). This can all be done via the Edit Settings tab of the VM post restore. Once this reconfiguration had been done on both VMs, I could then power up the vApp which will start both VMs, and my vCops application was functional once again. My final test was to use the default setting and verify that my vCops could be returned to a particular point in time while the original vCops application is still in place. This is very straight forward, as you just leave the ‘Restore to default location’ check box selected during the restore process. This worked as expected, and when powered up, my vCops was fully functional after the restore. 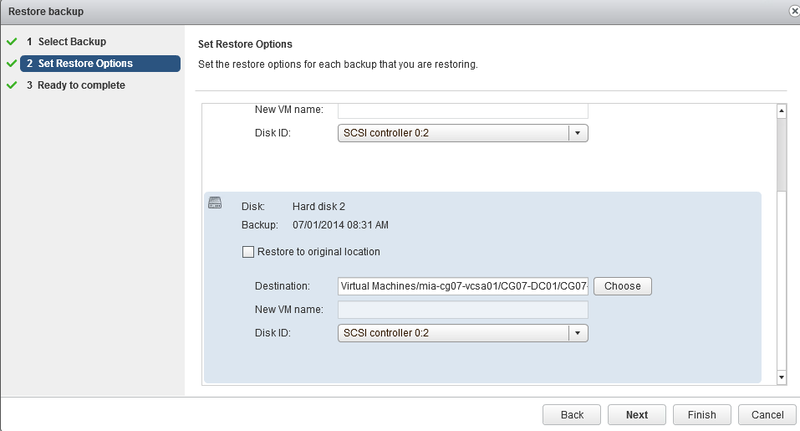 How do you backup your vCloud Suite components? What tools/backup products do you use? How do you verify consistency and prove that your backups are valid. I’d really like to hear from you, so please leave a comment.